Harad (Terminalia chebula) is a dried ripe fruit used across Asia in Ayurvedic medicine as well as Chinese medicine and Tibetan medicine, where its name translates to, “The King,” because almost all Tibetan herbal formulas contain the herb. It is one of the herbs used in “Triphala,” a powerful antioxidant and detoxifying combination of Amla, Baheda, and Harad Fruits. Reported to contain various biochemical compounds, much of Harad’s power comes from its power packed tannins. 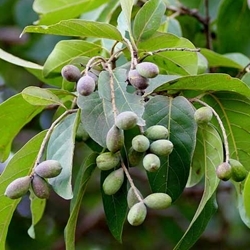 Harad (Terminalia chebula) is a dried ripe fruit used across Asia in Ayurvedic medicine as well as Chinese medicine and Tibetan medicine, where its name translates to “The King” because almost all Tibetan herbal formulas contain the herb. It is one of the herbs used in “Triphala,” a powerful antioxidant and detoxifying combination of Amla, Baheda, and Harad Fruits. Reported to contain various biochemical compounds, much of Harad’s power comes from its power packed tannins. Harad is a drupe. In botany, a drupe (or stone fruit) is an non-opening pod fruit in which an outer meat of the fruit surrounds a pit with a seed inside. Each Harad fruit contains one seed. Our Harad hails from the Vindhya mountains of India, and is the Vijaya variety, the most versatile variety of Harad. Terminalia chebula is native to South Asia from India and Nepal east to China, and down to Sri Lanka, Malaysia, and Vietnam. It is distributed up to 3000 feet above sea level. Harad fruit is one among the three dried fruits that make Triphala. Literally meaning “three fruits”, Triphala is a traditional Ayurvedic herbal formulation consisting of three fruits native to the Indian subcontinent: Amla (Emblica officinalis), Baheda (Terminalia belerica) and Harad (Terminalia chebula). Triphala is recommended and used more often than any other Ayurvedic herbal formulation. The combination of the three fruits has a synergistic effect to bolster the digestive systems and many other body systems. In Ayurvedic terms, Triphala, used in moderation, is said to have a beneficial effect on all three doshas—vata, pitta, and kapha— the three energies of the body believed to regulate all function. It is most well-known for its gentle effects on the digestion and cleansing the build up of toxicity. Ayurveda also views Triphala as a nourishing supplement known for its ability to rejuvenate healthy tissues, thus one is allowed to age gracefully. Modern scientific examination shows Triphala to be an excellent detoxification formula. As with any detox experience be aware that the sudden release of toxins from deep tissue can result in one feeling sick, having a headache, or stomach ache. This is normal in the expulsion of toxins. Traditionally Triphala was used as a tea by adding 1/2 teaspoon to water. Note: These statements have not been evaluated by the US Food and Drug Administration, and this product is not intended to diagnose, treat, cure or prevent any disease. We do not recommend internal use of supplements or herbs without prior consultation with your doctor. Harad and Triphala are advised to avoid during pregnancy.